A rendering of the Hebrew "shiryon" or "siryon," which would be more correctly translated "coat of mail" or "cuirass." The kings of Israel used in warfare (I Kings xxii. 34) such body-protectors as were in vogue among their neighbors (compare Goliath's "coat of mail," I Sam. xvii. 5). The character of this piece of armor, as seen on the monuments of Egypt, Assyria, and later in Rome, would indicate that it was a coat of various lengths, often, if not always, made of overlapping plates of metal (compare I Sam. xvii. 5; Deut. xiv. 9). It protected the breast and the back, and in some cases reached as far down as the knees. In certain passages (for example, II Chron. xxii. 14; Neh. iv. 16) the exact character of the armor specified can not be determined. 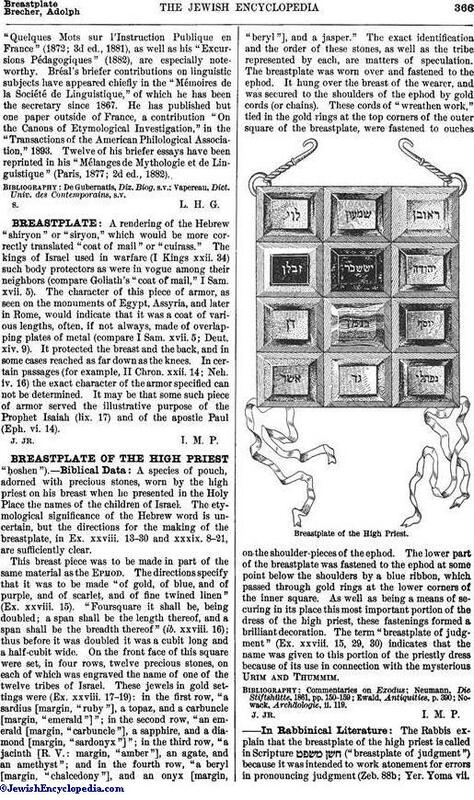 It may be that some such piece of armor served the illustrative purpose of the Prophet Isaiah (lix. 17) and of the apostle Paul (Eph. vi. 14).